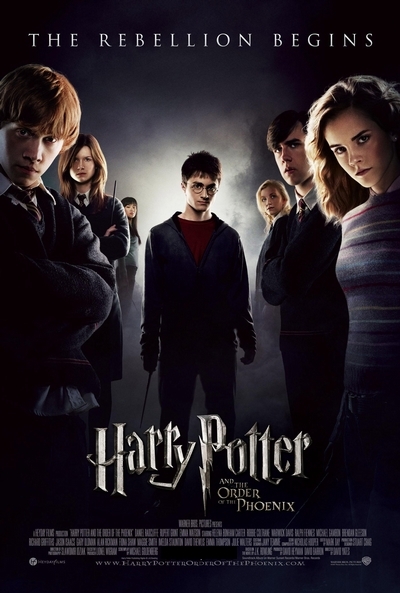 Story: In "Harry Potter and the Order of the Phoenix," Harry returns for his fifth year of study at Hogwarts and discovers that much of the wizarding community is in denial about the teenager's recent encounter with the evil Lord Voldemort, preferring to turn a blind eye to the news that Voldemort has returned. Fearing that Hogwarts' venerable Headmaster, Albus Dumbledore, is lying about Voldemort's return in order to undermine his power and take his job, the Minister for Magic, Cornelius Fudge, appoints a new Defense Against the Dark Arts teacher to keep watch over Dumbledore and the Hogwarts students. But Professor Dolores Umbridge's Ministry-approved course of defensive magic leaves the young wizards woefully unprepared to defend themselves against the dark forces threatening them and the entire wizarding community, so at the prompting of his friends Hermione and Ron, Harry takes matters into his own hands. Meeting secretly with a small group of students who name themselves "Dumbledore's Army," Harry teaches them how to defend themselves against the Dark Arts, preparing the courageous young wizards for the extraordinary battle that lies ahead.